There are many cases where shoes and boots don’t fit after bringing home. When the shoe design and model is lovable and the size is unfit, stretch shoes cobbler services is the best to stretch shoes to a desired size. High competition between shoes manufactures helps you buy unique design shoes you love but may not fit your foot. In these cases, stretch it to your size and wear your favorite shoe. There are many things that enhance the appearance of the shoes and boots. A stretch boots wide calf service is offered by professional and well experienced cobblers. At our Shoe Hospital, professional cobblers work on your footwear with utmost care. The services are available for men and women shoes and boots irrespective to the brand and quality of material. 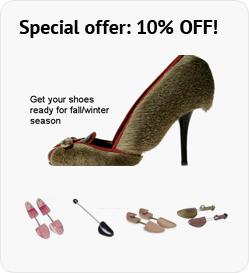 The finest mending services are offered here by providing stretch shoes one size perfectly. We can mend and stretch your boots to the desired size to fit your foot comfortably. When customers opt for stretch new shoes, there is no lapse in rendering the required service with shoe hospital, as customer-eccentric service is accessible with us. There are a few home-based methods to stretch boots that may not last long and there will be flaws in doing so. A professional assistance along with an efficient craftsmanship let users stay happy and walk in the required size of the boots or shoes. Finest workmanship is assured with every service offered at our Shoe Hospital. We are known for our quality of service for decades in NYC. Knee high stretch boots wide calf is one of our high priority service offered. There is no need to sing “Cobbler! Cobbler! Mend my shoes”, shoe hospital is a cobbler managed service that never amiss the task which is given to them. Stretch boots to the aspired size so as to enjoy wearing and walking along. At the Shoe Hospital, we don’t just expand the size of shoes or boots but there are many other services that are taken care in relation with the mending of the shoes. We are the best known cobblers in NYC for all stretching, mending, repair, shining, etc. services. Shoe stretching is an art and needs to be done in the correct way to ensure the modified size fits perfectly in the toes. Our trained experts use the widely tested techniques to provide you the best shoe stretching service in NYC. Get your shoes’ size done to perfection to enjoy them wearing again. Mending your most loved accessories is a wise decision to make and we help you to get these products back in shape within no time. You can avail our extensive services that include shoe repair, heels repair, shoe shine, stretch shoes and boots, belt adjustment and fixing, leather jacket repair, bag repair, men shoe repair, women shoe repair, luggage repair, dye leather and cut heels without any doubt. Are you able to re-heel a pair of Hunter rain boots? I have a pair of Hunter rainboots that are only 3 years old but the heels have worn down on them.